Dogs come in all sorts of sizes, colors, temperaments, and abilities. There are small dogs who love to cuddle and big dogs who love adventure. Some dogs need wheelchairs and others get by with only three legs! One important difference in dogs is their coats, as their coats will mean different kinds of care and will dictate how the dog might shed. Some dogs have a double coat, which requires a special kind of care! Double coats, as you might imagine, means that a dog has two layers of hair/fur. The first layer (the one closest to the dog’s skin) is an undercoat of short, often wooly hairs while the second layer is a longer hair called guard hairs. The undercoat helps with extreme temperatures, both hot and cold, and the top coat helps to keep out moisture and dirt. Many dogs with double coats will appear very fluffy, especially if they have a denser undercoat. Breeds with these kinds of coats include Golden Retrievers, Huskies, Bernese Mountain Dogs, Newfoundlands, and so many more. Some dogs with double coats won’t appear super fluffy, as Labrador Retrievers have a double coat too! Dogs with a double coat will need some extra care and grooming, as they tend to shed quite a bit. Springtime is the most intense time for shedding, as that’s the time when dogs lose their dense winter coat for their summer coats! But regular brushing can help your dog’s coat stay healthy, as it’s the perfect way to help remove dead hair from the coat. Getting rid of dead hair from a dog’s coat can help new hair to grow and eventually helps the coat regulate temperature! How often a dog will need to be brushed will depend on the breed and the time of year. Some will need to be brushed every day while others could be brushed only a couple times a month. One of the most important reasons to brush any dog, especially one with a double coat, is to make sure that their coats don’t grow too much and potentially mat. Overgrown coats and matted fur are both problems for dogs, as they limit the airflow to the skin and will cause a dog to overheat. Additionally, matted fur can be really painful for dogs, as it causes the skin to feel tight and can trap moisture. Trapped moisture right on a dog’s skin can lead to skin infections or inflammations. Springtime, as mentioned before, will be the worst time of year for shedding, especially with a double coated dog. As the weather gets nicer and warmer, dogs will lose their winter coat and shed a ton! This is called a ‘coat blow’ and can be taken care of with regular, more frequent brushing. You can bring your dog to a professional groomer during this time of the year but you can also spend a few minutes every day or two brushing your pup! There are several kinds of brushes you can get to help keep both coats healthy and clean. A wire brush (see right) is a great brush for any coat texture or length. 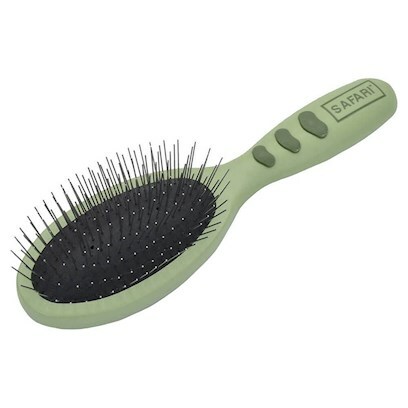 These brushes help to detangle the fur, much like a hairbrush would for humans! A shedding blade and a dematting rake are both great options for double coated dogs. A shedding blade is an oval-shaped, metal brush that helps to remove fur while a dematting rake looks like a mini rake with curved blades and rounded edges. However, a shedding blade shouldn’t be used to detangle a dog’s coat, as it would painfully rip out any hair clumps. One of the biggest mistakes you can make with grooming a double coated dog is shaving them for the warmer months. For humans, it makes sense to remove all the extra fur that these dogs have, as it does seem like having it would actually overheat the dog in sunny, hot weather. But in reality, their thick, double coats help to regular a dog’s temperature no matter the weather! Even in hot temperatures, a double coat can keep a dog cool. By shaving a dog, you remove their natural ability to cool down and expose their skin to the sun and a potential sunburn. The top coat is full of guard hairs and there’s a reason for that, as this top layer protects a dog’s undercoat and skin from dirt, moisture, and the sun. There are a few times in which a dog might need to be shaved but those instances are rare. If the dog needs surgery for any reason, vets will often have to shave a part of the dog’s coat. Plus, if the coat is matted in any area, the matted part should be shaved or cut! Other than those situations, there’s really no reason to shave your double coated dog, no matter how warm you think they might be. Dogs of all kinds are great and do require regular grooming but there’s a certain amount of care that goes into dogs with double coats. Regular brushing will help keep their coats clean and healthy and should help keep the amount of hair left on your floor down! While professional grooming can help you keep on top of care, spending a few minutes brushing your dog on a regular basis at home can also make all the difference.